6 Alternatives to Mercury Thermometers - Gilson Co.
Mercury is increasingly recognized as a material that’s difficult to ship, can be hazardous to the environment, and presents high costs if spillage occurs. Regulatory measures are confusing, complex and vary widely from state to state, and even between local areas. Standards organizations such as ASTM and AASHTO recognize the difficulties mercury thermometers present and requirements of many testing procedures are being modified to incorporate the use of non-mercury thermometers. Here at Gilson, we want to make it as easy as possible to identify the best alternative devices for your application, if mercury thermometers are not an option for you. In addition to some non-mercury friendly thermometric equipment options to be aware of, this blog post will provide information on what is used in thermometers instead of mercury. It will also explore a range of digital devices available for lab or field measurements. ASTM Non-Mercury Thermometers comply with test method requirements for use in their referenced applications and duplicate performance characteristics of ASTM Mercury-filled Thermometers, but use a safe blue liquid indicating fluid. 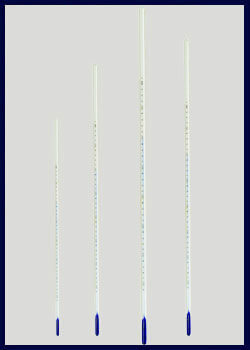 ASTM Equivalent Non-Mercury Thermometers have the same physical and performance characteristics as ASTM Non-Mercury Thermometers and the same ranges and divisions as ASTM Mercury-filled thermometers, but have not yet been reviewed by ASTM subcommittees for their referenced applications. 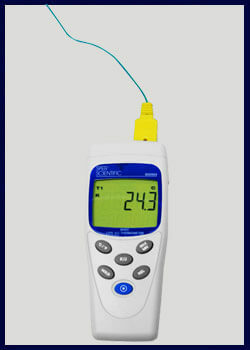 These thermometers also use a safe blue indicating liquid instead of mercury. Digital Thermometers are useful for a variety of applications such as air or fluid readings, surface temperatures, high-temperature applications and more. Today, digital thermometric technologies are versatile and generally superior to the mercury-in-glass design, with wider effective temperature ranges and faster equilibration. Traceable Printing Thermometers are a specific type of digital thermometer that offers permanent, hard-copy documentation and full-time monitoring for today’s stringent quality control requirements. 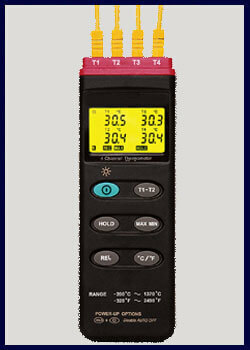 4-Channel Thermometers use up to four optional probes to display data on a backlit LCD screen in °C or °F using standard Type K Thermocouples. 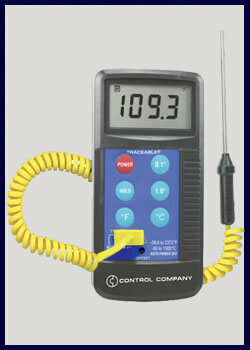 Basic Type K or J Thermometers deliver precise temperatures for many different applications. You should be aware of state/regional restrictions. 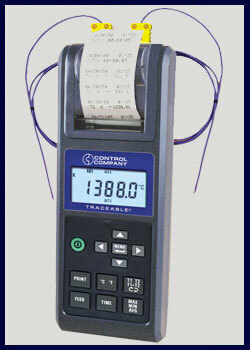 If there are no restrictions in your area, we’ll continue to ship mercury thermometers to you. Please Contact us if you need help selecting a non-mercury alternative.